and beer (Wisconsin) and check out the madman once more at Beloit Riverfest. high school kids checking out Alice and enjoying what they saw. Cooper's antics make him a universal icon...seedy but not scandalous, weird but not scary...and the cleverness of his recent albums, mining the nu-metal and garage rock genres further enhances his youth appeal. I get the feeling that a lot of kids who bought stuff like White Stripes and The Vines probably dug a lot of what they saw tonight. jacket. Where once these antics terrified 70's conservatives, now they are seen as warm and fuzzy, even when Alice skewers a baby doll on a sword and flings it away with contempt. could have been better used to play some old classics like "Teenage Frankenstein" or "Elected". Cooper managed to slip some surprising old nuggets into the night's show. The whole shebang opened up with an epic "Hello and Hurray"; leading into the more expected "No More Mr. Nice Guy". The set also saw the welcome return of "Cold Ethyl", where Alice fondled a rubber-limbed love doll in the image of a woman he supposedly just killed (actually played by his daughter...figure that one out! ), "Desperado", and the catchy "Who Do You Think We Are?" We got a pretty strong "Billion Dollar Babies" and best of all was the encore, which pieced together the excellent "Brutal Planet"(one of his most underrated LPs), the hair metal hit "Poison" and the all-time classic "Under My Wheels". fit pretty well with the rest of the set. Outside of that, the usual suspects like "I'm Eighteen", "School's Out", "Only Women Bleed" and "Ballad of Dwight Frye" all put in an appearance. Not a perfect show (it was the first night of the tour), this was still a fine rocking time delivered by the grand old man of the macabre. Alice shows no sign of slowing down! 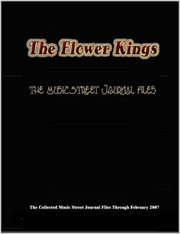 This review is available in book format (hardcover and paperback) in Music Street Journal: 2004 Year Book Volume 3 at lulu.com/strangesound.